Our sites do not demand much more or less than other sites. But for an optimal performance you should at best check your settings. The "cache" keeps copies of frequently visited web pages on your hard drive. This reduces the amount of time it takes to display a page you have visited in the past. Attention: people who surf with a slow connection (like less then 128 mpbs, such as a 56k modem) should increase their cache size. Why? If you download a comic, like 5 MB, it may get interrupted when only finished for 40% or so. If this happens, this means packages are getting lost on the internet. So it is best to right-click the file and choose SAVE AS. Then you download it. If the download gets aborted, you may retry without loss. 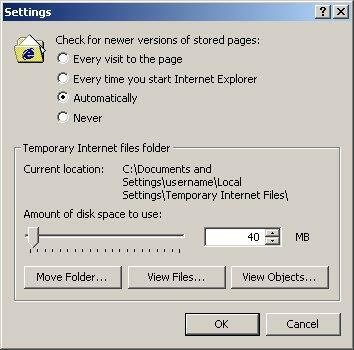 If your cache settings are high enough (at least 20 Mb) internet explorer will RESUME the download! You will notice that if you restart the download of the same file again, it will start where it stopped! So you do not need Download Managers (third party software) to have downloads 'resume'. Make sure that the General tab is selected (there are several tabs at the top of the Internet Options window, General, Security, Privacy, etc.) just make sure that General is selected. In the example above, General is selected. Notice at the top of the Settings window it says Check for newer versions of stored pages: and in this case the first "button" (Every visit to the page) is checked, which is not the most optimal setting. If that is your setting, then you better change it to "Automatically". Also notice the "Amount of disk space to use". Please be sure it is more than 30 MB. If it is set to more than 100 Mb, please reduce it, as it will rapidly slowdown your computer!